Guitarfish look somewhere between a shark and a ray, with the dorsal and caudal fins on the back half of its tubular body, and a narrow pectoral disc at its head. 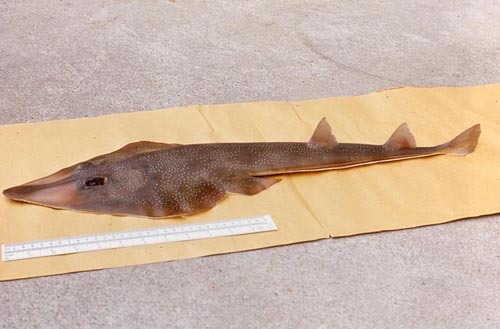 The Atlantic guitarfish is one of the smallest, growing to almost 30 inches, and gray to brown on top with white freckles, while whitish underneath. There are translucent patched on its rostrum (snout) which it uses to dig up or pin down the crustaceans and mollusks that it eats. It likes to bury itself in sand along the shoreline, but can also be found in brackish or freshwater weedy and muddy bottoms. 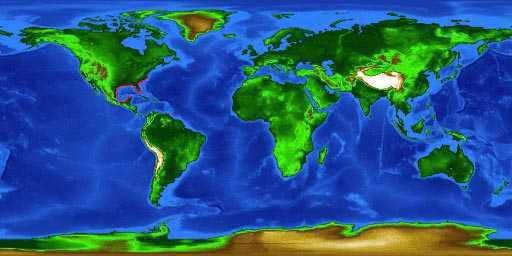 In the United States and the United Kingdom, R. lentiginosus is known as the Atlantic guitarfish. Other common names include: chuchu blanku (Papiamento), chuchu di santu (Papiamento), freckled guitarfish (English), geigenrochen (German), gitaarrog (Dutch), guitarra (Spanish), guitarra moteada (Spanish), hajrocka (Swedish), hvalhaj (Danish), pesce violino (Italian), poisson-guitarre tacheté (French), pyatnistyi gitarnyi skat (Russian), rejnokovec atlantský (Czech), rina (Greek), sakatazame (Japanese), småskaellet guitarfisk (Danish), spotted guitarfish (English), sproetige gitaarrog (Dutch), täpläkitararausku (Finnish), viola (Portuguese), vioolrog (Dutch). 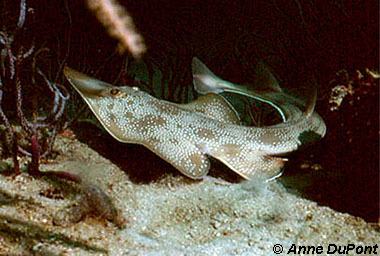 In the United States, the Atlantic guitarfish is primarily caught in shrimp trawls as bycatch and is of no interest to fisheries or anglers. The Atlantic guitarfish is considered harmless to humans. 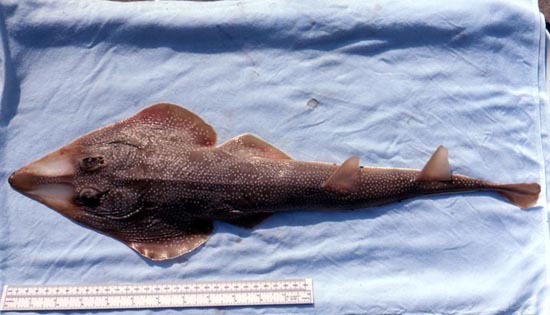 > Check the status of the Atlantic guitarfish at the IUCN website. The World Conservation Union (IUCN) is a global union of states, governmental agencies, and non-governmental organizations in a partnership that assesses the conservation status of species. The Atlantic guitarfish inhabits the western Atlantic Ocean from North Carolina to the northern Gulf of Mexico and Yucatan, Mexico. Predominantly found in tropical coastal waters, this fish occasionally occurs in estuaries and freshwater habitats. These fish often bury themselves in sand, mud, or weedy bottoms near patch reefs. They can also be found along beaches anywhere from the shoreline to as far out as 98 feet deep (30 meters) and are believed to tolerate fresh, brackish, and marine water. 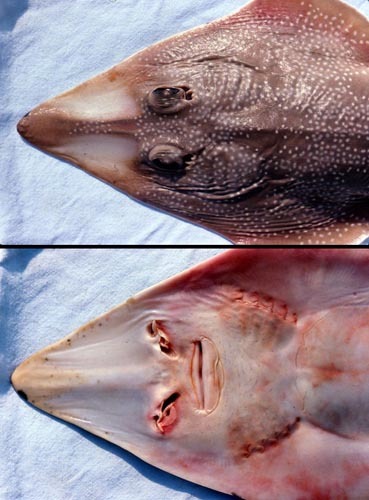 Guitarfish have the appearance of both a shark and a skate — their bodies are dorso-ventrally flattened like a skate or ray and the tail has two dorsal fins similar to most sharks. The pectoral fins are fused to the head, creating a heart- or triangle-shaped head and body. A few tubercles are typically found on the tip of the snout. The origin of the first dorsal fin of the Atlantic guitarfish is behind the pelvic fins. The Atlantic guitarfish has no spine on its tail. Guitarfish swim somewhat as sharks do, by moving their thick tail and caudal fin in side-to-side motions. The Atlantic guitarfish also uses its pectoral fins for acceleration and maneuvering. Instead of swimming perfectly horizontal, the Atlantic guitarfish typically maintains a positive swimming angle with its head just slightly higher than its tail. The dorsal side of the Atlantic guitarfish is gray, olive brown, or chocolate brown and typically with white freckles covering the surface. The coloration of the area on either side of the rostral cartilage is pale to translucent. The fins are usually slightly darker than the trunk of the fish and its ventral side is white to pale yellow in color. Both sexes of the Atlantic guitarfish have 56-80 blunt teeth in the upper jaw and 51-82 teeth in the lower. In the upper jaw eight to ten rows of teeth are functional and seven to nine rows of teeth are functional in the lower jaw of large guitarfish. The teeth are rectangular at the base with rounded corners and fit closely together. The dorsal denticles are very small and set closely together with skin visible between them. They are arranged in a row along the dorsal midline and vary greatly in shape depending upon their location on the guitarfish’s body. The denticles along the midzone of the back are egg-shaped at the rear of the denticle and irregularly pointed at the front end. Denticles on either side of the rostral ridge are spear-shaped with concave margins. Those along the sides of the tail are more egg-shaped than pointed. The denticles on the guitarfish’s ventral side are slightly rounded, irregularly hexagonal or tetragonal, and completely cover the skin. One of the smaller species of guitarfish, the Atlantic guitarfish only reaches a total length of approximately 30 inches (75.0 cm) (Lieske and Myers, 1994). Males have been recorded at 29.5 inches total length (75.0 cm) and females at 29.9 inches total length (76.0 cm). Atlantic guitarfish feed on bottom-dwelling creatures, including molluscs such as scallops and crustaceans such as shrimp. The Atlantic guitarfish also eat a variety of small fishes. While catching prey, the guitarfish uses its rostrum to hold the prey against the sea floor and also to block the prey’s escape route. These fish reproduce via internal fertilization and give birth to live young. The young are born fully developed and measure approximately 8 inches (20 cm) total length (TL). There can be as many as 6 pups in each litter. Males are believed to be mature at 19-20 inches (48-51 cm) total length as indicated by well developed claspers at these sizes. It is likely that larger predatory fish sharing the same geographical location and habitat consume the Atlantic guitarfish. Atlantic guitarfish belong to the subclass Elasmobranchii, which includes stingrays, skates, and sharks. The Atlantic guitarfish was originally named Rhinobatos lentiginosus by Garman in 1880 and this name is still valid today. The genus name comes from the Greek words “rhinos” meaning nose and “batis, -idos” meaning a ray. Rhinobatus lentiginosusGarman, 1880 is the only name applied to this species in previous scientific literature.